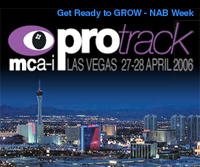 MCA-I ProTrack(TM) will be held in Las Vegas April 27th and 28th 2006 at the Las Vegas Convention Center adjoining the NAB Trade Show. 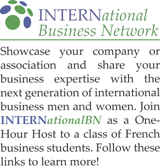 This gathering of our industry’s best & brightest in-house and independent professionals offers a remarkably rewarding opportunity to share and learn. So that you get the best workshops you need to accelerate your career, share your ideas thoughts and input in this brief four-question survey. We’d like to know what your “something” is. What would you like to learn about, investigate or discuss? So if you haven’t already done the survey, how about refilling your coffee, tea or whatever, come back and click on the link above and fill out this very brief survey right now. C’mon! It’s only four questions! We need your input by January 15, 2006 to design the 2006 ProTrack conference sessions.